Story blurb: The most important things in Simon Murray’s life are football, friends, and film—in that order. His friends despair of him ever meeting someone, but despite his loneliness, Simon is cautious about looking for more. Then his best friends drag him to a party, where he barges into a football conversation and ends up defending the honour of star forward Declan Tyler—unaware that the athlete is present. In that first awkward meeting, neither man has any idea they will change each other’s lives forever. Like his entire family, Simon revels in living in Melbourne, the home of Australian Rules football and mecca for serious fans. There, players are treated like gods—until they do something to fall out of public favour. This year, the public is taking Declan to task for suffering injuries outside his control, so Simon’s support is a bright spot. But as Simon and Declan fumble toward a relationship, keeping Declan’s homosexuality a secret from well-meaning friends and an increasingly suspicious media becomes difficult. Nothing can stay hidden forever. Soon Declan will have to choose between the career he loves and the man he wants, and Simon has never been known to make things easy—for himself or for others. About the author: Sean Kennedy was born in 1975 in Melbourne, Australia, but currently lives in the second most isolated city in the world (although there still seems to be conjecture over whether it is actually number one). Living in such deprived circumstances can only affect his writing, which is published by Dreamspinner Press. 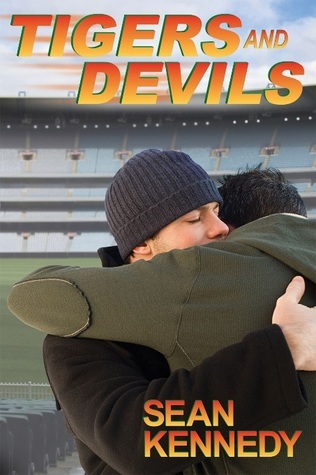 Seeing all the five-star reviews for Tigers and Devils (Tigers and Devils #1) by Sean Kennedy [Dreamspinner Press; 2 edition, August 30, 2012] is very impressive. I liked it too (deservedly so), but I couldn’t quite go five bees. The blurb synopsizes the plot quite well, and so I will concentrate more on what I liked and was reserved by in this book. I thought the plot—although not particularly unique—was captivating with some nice romantic scenes, and enough angst to keep it interesting. I also liked how the author brought the two somewhat disparate characters together: with Simon defending Declan while he was present, but unbeknownst to the other. Nice touch. The character development is well done, over all. I had a good visual sense of Declan, but not so much his thinking. Of course, this is largely due to Simon’s first-person point of view, so it is a minor drawback. The secondary character were interesting as well—particularly Simon’s married friends who added different dimension to the story. It also goes without saying the the writing is first rate. I did have some issues with pace. It seemed to drag in places—particularly in the first half of the story—and, as has been mentioned by others, this is partially due to the length. However, I do sympathize with the author on this point. I also hate to part with prose after I have laboured over it. It’s sort of like cutting off an ear lobe. That said, I really did like the story and I think you will too. Four bees. Thanks for dropping by. I’ll have another great find next week, so be sure to drop by then.